When I [Joan Barksfield] returned to the school at the end of September Mrs Gray was temporarily in charge but, as she had no experience with Juniors, I took the upper class and virtually ran the school until Mrs Davies was appointed. In January Mrs Low replaced Mrs Gray. Mrs Gray had worked in large infant schools and was a great help in making equipment for the Infants. mostly from waste materials, and in reorganising what little apparatus there was to the best advantage. The school was woefully short of useful equipment due to the low roll (Note 51) and the scarcity of books, paper etc. during the war and post war years. We had 30 children on roll and we kept them hard at work. The usual visitors called. The children had their accustomed Christmas party with a tree and presents. In January I took the children to a puppet theatre in High Wycombe. In February they were given a slide show on South Africa. An HMI visited the school and gave us a mandate to 'spring clean' the cupboards, get rid of ancient and broken furniture and a great collection of articles left over from the war period. The only alteration to the building during 1953 was the installation of coke burning stoves. On windy days the open fires were troublesome. Due to the straight flues and outside chimney breasts, a north or south west wind filled one or other of the rooms with billowing smoke. As the coke stoves were fitted into the same flues the smoke was replaced by coke fumes. Although a succession of different types of cowl were fitted these stoves were never a great success. In theory they stayed alight from Monday to Friday but in practice one or other often burnt out in the night and proved much worse to clean out and relight than the old open fires. 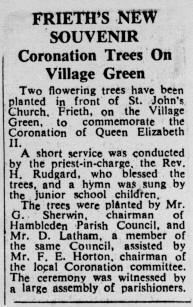 During March the village began making preparations for the Coronation Celebrations of Queen Elizabeth II. The children were to be involved in these so I was asked to be on the committee. The Celebrations took place after Mrs Davies was appointed but she felt it was too late for her to take over the arrangements. The children took part in a fancy dress parade, a sports afternoon and were given tea in the Village Hall. The older children submitted essays for a competition. Each child received a Coronation Mug. The children sang "All things Bright and Beautiful" - see also next page. "Found the Frieth History site the other day, and the memories certainly came flooding back. I do believe that your mother was my first teacher in September of 1952, when I was 5. My memories of both Mrs Barksfield and Mrs Davies are extremely fond ones, and I do recall that Mrs Davies taught us boys knitting, and she also taught some Welsh songs, which I assume were some of her favourite. Again I can fondly recall that lilting Welsh accent she had. She was certainly strict, but very fair, and both of the teachers, certainly taught me well anyway. I was from the “new” council estate in Ellery Rise, and must have been, along with the Glenister girls and Maureen Bird, one of the first children to start Frieth School from that estate. I remember, when aged about 12 I think, helping the milkman, Percy Tucker, and I remember him as quite a character then. I used to do an hour before school and weekends with him, earning 12/6d a week. I [ also remember ] Frieth Cricket Club. 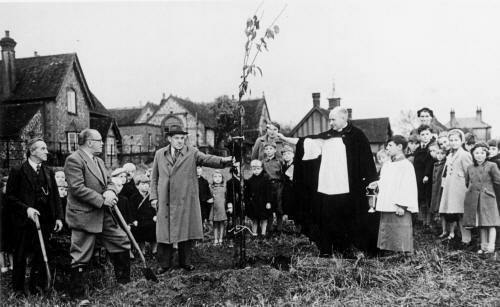 The ground was opposite St Katherine’s Convent, as I remember it, set within a rather large field. I started playing when I was 14, and at that time, Geoffrey Johnson Smith, who lived in Parmoor, bought a whole group of celebrities each year to play against Frieth in a charity game. A great stalwart of the team was Toby Martin, who umpired, and it was his sons, Keith and Barry, who took over the milk round from Percy Tucker. I also remember the Blacksmith’s Forge, where I used to watch in awe as the horses were re-shod, and of course the “horse pond”, which last time I visited the village, had been filled in, for health and safety I suppose, although such things never bothered us lads, when we built rafts to sail on it. All in all, a very happy rural upbringing., although we left Frieth in August 1963 to move to a bigger house in Lane End." Click to go on to the next chapter "Mrs G J Davies 1953 - 1960"
(51) Capitation Allowances : At this time each school was given an allowance to purchase books, stationery and educational equipment. The Headteacher had full discretion on how this allowance could be spent. It was based on the number of children on roll in the January of each year. Small schools were allocated a block allowance based on each 10 children, which meant that schools like Frieth had a little higher amount to spend per child than large schools. In addition claims could be made to the Education Office for renewal of furniture and larger equipment which could not be afforded out of the school's allowances. In practice one was never allowed, from the Pool, enough to meet the needs of the school. this was especially the case when a head was trying to overcome past deficiencies.